Enzo Life Sciences continues to invest in developing new immunoassays. As a leading manufacturer of ELISAs, Enzo continues to launch relevant immunoassays into the market. The new Melatonin ELISA Kit provides a simple an accurate measurement of melatonin. Melatonin (N-acetyl-5-methoxytryptamine) is produced in the pineal gland and is a major component of the regulation of the circadian rhythm. Melatonin and its metabolites have demonstrated antioxidant properties and have been implicated in some reactive oxygen species pathways. The Melatonin ELISA KIT provides a quantitative, competitive detection method for measuring melatonin in serum, plasma, saliva and fruit homogenates. These sensitive assays measure as little as 0.162 ng/ml of melatonin and provide fully quantitative results. It provides a simple and precise measurement of melatonin in multiple matrices without the need for time consuming incubations or column preparations. With the ability to analyze up to 40 samples in duplicate in less than 2 hours, these kits meet the needs for rapid, high-throughput analysis. 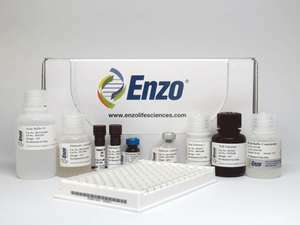 Like many other Enzo Life Sciences ELISA kits, the Melatonin ELISA kit is complete, flexible and thoroughly validated. They are supplied with an easy-to-follow protocol, pre-coated microtiter plate and liquid color-coded reagents to save the user time and reduce errors. The break-a-part strip plate design provides flexibility – not having to run all 96-wells at once. Each kit is put through rigorous fit-for-purpose validation and stability testing to ensure high precision, accuracy, sensitivity, and specificity. The release of the Melatonin ELISA kit is the most recent addition to the Enzo portfolio of products for oxidative stress, neuroscience, cancer, aging, immunology and endocrinology.